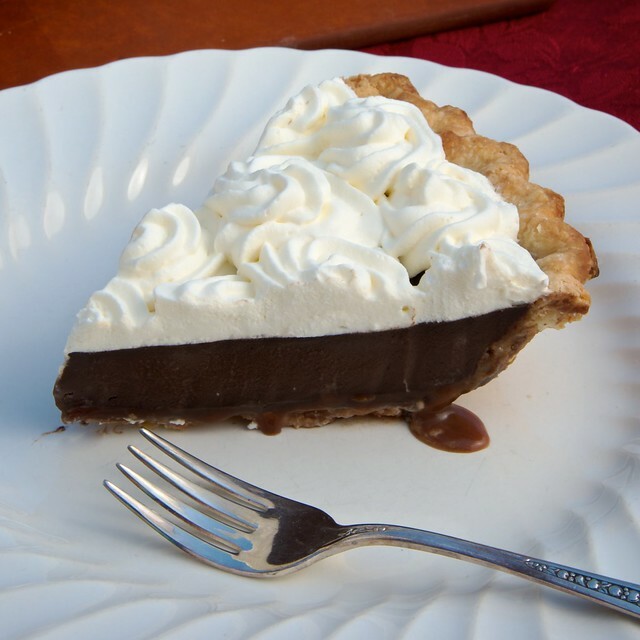 Chocolate Cream Pie is one of my all-time favorite desserts. It's like eating chocolate pudding, only better, because it's coupled with a perfectly flaky pie crust, and then smothered with whipped cream. Now I'm not talking about those terrible chocolate pies you can get at stores or in restaurants. In my opinion, a pie with a sub-standard pie crust is simply not worth eating. For that reason, I rarely eat pie unless I make it myself. This pie crust is so good, you'd eat it all by itself — even without the chocolate filling. But why would you do that and deny yourself that lovely chocolate filling? This pie is not only delicious, but it's also good for you. The recipe calls for lots of raw grass-fed milk and cream, pastured eggs, and the pie crust uses grass-fed butter and beef tallow or lard. So you're getting plenty of good fats and fat-soluble activators in this dessert. Your family and friends are going to love this chocolate cream pie! Be sure to make this ahead of time. You need to chill the pie at least 3 hours before you can eat it. If you like, you can make your pie dough a day or two ahead — just store the dough (not yet rolled out) in the fridge. Do not buy lard at the grocery store. It is full of antibiotics and Only use lard from pastured pigs. If you can't get your hands on good pastured lard or beef tallow, use all butter (get grass-fed butter if at all possible) in your crust — it works just fine. If you can't get your hands on sprouted wheat flour, you can use 100% unbleached all-purpose flour in this recipe. 1. Add flour, sea salt and sugar to a large mixing bowl. 2. Cut very cold butter and lard or tallow up into large chunks and add to the bowl. If using tallow, you can grate it with a box grater. 3. Slowly add ice cold filtered water, a little at a time, as you mix the pie dough with your (clean) hands. You don't have to use all the water — just use a little at a time and just use enough to hold it together. If you need to use more water than 1/3 cup, use more. Just add slowly & be sure it is ice cold. This is important: only mix until the lard and butter hunks are no smaller than the size of peas. Better yet, the size of olives. Do NOT overmix! This is the most important part of making a good pie crust. You must have little blobs of fat — this is what will make the pie crust flaky and light, not dense and hard like a rock. NOTE: If you are using tallow, you will need to cut it up smaller because it will not roll out as it stays hard at room temperature. If you like, you can grate the tallow with a box grater. If you are using lard, leave it in big pea- to olive-sized blobs just like the butter. 4. Pat the dough into a large ball, wrap in plastic wrap and put in the fridge for at least 30 minutes. 5. Set an oven rack at the lowest level and preheat the oven to 350 degrees. 6. Lightly grease a pie tin with butter. 7. Roll out the ball of dough on a floured surface. You should clearly see the blobs of butter and lard in the dough. 8. Transfer the dough to pie or tart pan, and trim the edges. An easy way to do this is to simply roll your rolling pin over the tart pan. 9. Poke holes in the pie crust with a fork. 10. Bake the crust: line with foil or parchment paper and fill with pie weights. You can use dried beans or rice if you don't have any pie weights. Let bake until fully cooked — about 30-45 minutes. 11. Remove from oven; let cool for at least 15 minutes before filling. 1. Chop the chocolate finely using a chef's knife. 2. Bring milk & cream, salt, and about 3 tablespoons of the sugar to simmer in a medium saucepan over medium-high heat, stirring with wooden spoon to dissolve sugar. 2. In a small bowl, stir together the remaining sugar and cornstarch in small bowl, then sprinkle over the egg yolks and whisk, scraping down sides of bowl, if necessary, until sugar has begun to dissolve, about 1 minute. 3. Whisk yolks thoroughly in medium bowl until slightly thickened, about 30 seconds. 4. When half-and-half reaches full simmer, drizzle about 1/2 cup hot half-and-half over yolks, whisking constantly to temper. 5. Whisk egg yolk mixture into simmering half-and-half (mixture should thicken in about 30 seconds). 6. Return to simmer, whisking constantly, until bubbles begin to burst on the surface and mixture is thickened and glossy, about 15 seconds longer. 7. Off heat, whisk in butter until incorporated; add chopped chocolate and whisk until melted, scraping pan bottom with rubber spatula. 8. Stir in vanilla, then immediately pour filling into baked and cooled crust. 9. Refrigerate pie until filling is cold and firm, about 3 hours. 1. Just before serving, beat cream, sugar, and vanilla in bowl of standing mixer on low speed for about 30 seconds. 2. Increase speed to medium and then high; continue beating until cream is smooth, thick, and nearly doubled in volume and forms soft peaks, about 20 seconds. 3. Spread or pipe whipped cream over chilled pie filling. Cut pie into wedges and serve. Does the caramel separate out on it’s own, or is that an extra step I’m not seeing here? There is no caramel in this recipe. The picture says caramel-bottomed Guinness chocolate pie…?? That is not my picture — it’s from Flickr. I do my best to get posts up but I don’t usually have time to take pictures. Do you think I could use gelatin in place of the arrowroot powder? Have you ever used home-ground flour in this recipe? Maybe a soft white wheat would work… what do you think? Yes I use home ground sprouted flour. Mine is hard red wheat. I haven’t tried soft white wheat in a pie crust but give it a try. Could one use 100% home-ground flour, instead of 50% unbleached all-purpose? Yes you can. It will be a little more crumbly and maybe not what people are used to. I prefer to use 50% white flour. I would think soft, white wheat would work even better! Can you please explain the different types of chocolate. I have raw cacao powder. Would that work for “unsweetened chocolate”? No — you need unsweetened baking chocolate. It depends on which store I go to to buy chocolate chips. Usually Trader Joe’s or Whole Foods. I just get whatever they have. I don’t worry about the soy lecithin because it’s a very small amount. I have never used pie weights before to bake a pie crust. Interesting! Do they make much of a difference? Have you ever tried sweetening your whipped cream with raw honey and vanilla? I am OBSESSED with the taste. I eat it as a dessert with berries as often as possible. I’m lucky I have access to amazing raw honey. If you do too, try it….sooooo good. Pie looks delicious! I have memories of French Silk Pie from Poppin’ Fresh Pie restaurants when I was little. This might just fill that void – thank you! The idea that this is a healthy food is utterly ludicrous. The only healthy parts are the lard/butter and cream. What a shame, you’re such a fraud. And milk, and egg yolks and chocolate which contains a lot of antioxidants! What about this is not healthy? OK, the chocolate and sugar, but what else? (I left out the eggs, they’re also healthy) But who needs more? The chocolate (not the actual cacao but the sweetened chocolate with soy, sugar and powdered milk) and the sugar are plenty- but add in the milk (which is effectively pasteurized after simmering) and the cornstarch and the flour, and it’s a health disaster. Do some research on glycation and advanced glycation end products. This is a super high glycemic food that will skyrocket your blood sugar. You can get closer to the source for a sugar source that includes trace minerals and vitamins, but it isn’t possible to make sugar healthy. It’s like washing down your daily vitamin with a beer. I realize that chocolate is not healthy. However, there’s VERY little soy in that – it’s a miniscule amount. Heating milk at home does NOT pasteurize it. That is an exaggeration. This pie is 50% sprouted flour. And it’s mostly unrefined sweeteners which are rich in minerals. The glycemic index has been debunked by many. A health disaster? OK, whatever. I don’t see a problem with washing down a daily vitamin with a beer. I like beer. And PS: Maybe you wouldn’t be so cranky and feel the need to call people nasty names (“fraud”) on the internet if you let yourself eat pie every once in a while. I don’t like it when people insult me and use smiley faces. If you don’t like the stuff I post on my blog, don’t read it. I don’t generally read your blog, I prefer fact to fiction. But a friend ‘liked’ your post (which showed in my feed) so I thought I’d check it out. There is this whole little anti-Cheeseslave faction forming- folks who used to think your info was solid until you went off the plantation. Mountain-Man I-Am is considering forming a “Gheeslave” page just to counter your blog so people know what NOT to do in their quest for good health. Again, if you don’t like the blog, don’t read it. I know I’m late to the party, but I can’t believe anyone would argue that simmering milk doesn’t do more damage than pasteurizing it. If you’re going to simmer it, don’t waste your raw milk, use the stuff from the store. Or skip the pie altogether and find something that’s actually healthy in moderation. Nah, Anne Marie, the recipe doesn’t make you a fraud, YOU make you a fraud. I know you better than you think. First, I didn’t mention the glycemic Index so its validity here is moot. The issue with pasteurization is that it destroys enzymes and vitamin D, and makes calcium unavailable. Add to that that it deforms the dairy proteins and causes allergies. Please, how uneducated must one be to not recognize that simmering milk accomplishes EVERY one of these things. In fact, to an even greater degree as simmering occurs between 200 and 212 degrees, while pasteurization occurs at a max of 135°. If this pie is cut into 6 slices, each slice contains 53 grams of carbohydrate and 21 grams of sugar. That’s only 1 gram less than an 8oz glass of SPRITE. It’s as much as THREE Fun Size (not bite size) Snicker’s Bars. Do you think some wonderful fat makes up for that? Hardly. Then let’s consider that the flour, starch and sugar alone account for 366 calories in that one slice- and the fats and proteins haven’t even been added in yet. Thet number is likely to double or even triple then. A dessert that constitutes half of the average person’s daily energy intake? Wowzers! The human body doesn’t care whether the sweetener is unrefined or not. Blood glucose rises exactly as high and as quickly whether you consume a tbsp od Dominos white table sugar or Sucanat. I know how much you love your carbs dear, but the science is irrefutable. No matter how much you wish it were not so, sugar is BAAAAAD for the human body. I can’t tell who this is but I’m guessing this is Paleo Huntress, the same person I blocked from Facebook because of the continual harassment. Seriously, Huntress, you need to get a life. If you don’t like what AM has to say, then move on. Your behavior is annoying. Seriously. What are you like 12? Go back to middle school. The mean girls miss their ring leader. Sorry “Huntress”, my fantasies of healthy chocolate pie haven’t been blown by your “life of truth” or whatever. There are ups and downs to anything you can eat. Chocolate cream pie isn’t going to kill you anymore than eating goitrogenic cruciferous vegetables or greens full of oxalic acids. Get a grip. Chocolate cream pie in moderation as part of a healthy lifestyle, especially when made with quality ingredients, is no fantasy. It’s real. You sound like you could stand to get your dopamine flowing, have you tried the pie? I hear it’s delicious. Oh sweetie… you do NOT want to get into a snarkfest with me. Let’s just leave it before AM has to close the comments altogether. Yuck. I hate it when angry people I don’t even know call me “sweetie”. Almost as much as I hate rigid, ridiculous health dogma and nasty vitriol from people who believe that their way is the only way. I won’t close the comments, but I will ban you. Especially if this is who I think it is. Sounds like someone could use a sundae! there’s enough fat in this recipe to counteract a lot of this sugar effects on the blood. I think you need a big fat slice of chocolate pie!! THis pie sounds delish!!! Love your blog, Cheeseslave. I don’t know why this went under you, AM. I was replying to Huntress…….he she sure is having a bad day. Well, then dearie, don’t eat it. No one is holding your feet to the fire. And the rest of us are adults and can do our own research and make our own decisions. Your attitude makes me want to make this pie even more. My reply was also to huntress. I had some extra milk and didn’t want to make a pie, so made the filling recipe as pudding. Yum! So rich and chocolaty that I HAD to whip some cream to put on top! This pie looks AMAZING! Just ran across it. Hope to be able to try it soon. Keep up the good work! So glad you blocked that annoying person that was attacking you! Who died and made them the health god?? This is a far healthier recipe than any other I’ve seen. Did have a question tho. If you can’t get your hands on good pastured lard or beef tallow, use all butter (get grass-fed butter if at all possible) in your crust — it works just fine. If you can’t get your hands on sprouted wheat flour, you can use 100% unbleached all-purpose flour in this recipe. So if you can’t get the sprouted flour and pastured lard you use a total of 1 1/2 c unbleached flour and 1/2 c + 5 TBSP butter? I came across this recipe a couple of weeks ago, and finally got around to trying it last night. I wasn’t so sure about the taste at first – it was rich, but seemed like something was missing, flavor-wise. However, after a night in the refrigerator, it was delicious! I took the pie to a potluck today, and it got raves (one man went so far as to say that, were I single, he would have proposed on the strength of the pie alone). This was delicious! I made it for our Thanksgiving and it one of the first pies to be devoured out of a dozen or more desserts (second only to 94 yr. old great grandma’s real apple pie) Yay for real food! I used a little less butter in the chocolate filling because I was running low…about 4T instead of the 6. It turned out just fine. Some people thought it had coffee in it, but it was just the real chocolate flavor coming through instead of being overloaded with sugar. I added gelatin to the whipping cream to help it hold up (a stabilized whipping cream recipe), then I topped with curls of chocolate. I would make this again. Thanks Ann Marie!